This redware sculpture is done with traditional materials and sgraffito decorating technique. I was inspired by English "pew group" figures, Staffordshire figures and early American redware figures to get the motifs I use off of my plates and chargers and see what they look like in 3 dimensions. Executing sgraffito on a on a 3 dimensional piece is a challenge but can be quite effective. 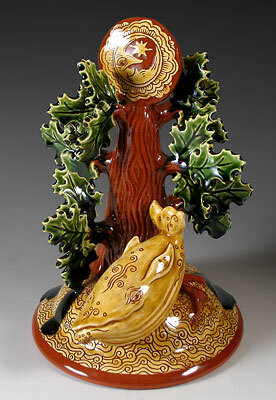 This is one of a series of tree sculptures I have been working on, with a whale getting into the act this time. I'm quite pleased with the combination of traditional workmanship, folk themes and mystery it has. It is signed in sgraffito on the backside of the piece.